Once upon a time, before TOI became euphemism for toilet paper, they ran a column called cook-in with Jiggs Kalra, some recipe’s were actually do able in a daily home kitchen once we mastered the basic recipe it took just as much time as our standard dishes did. This one received mixed response like “awful” from my husband, and “awesome” from my kids. The trick I finally discovered was ensuring that the Mango was really raw. 600gm Bhindee cut in to 1”length and deep fried. 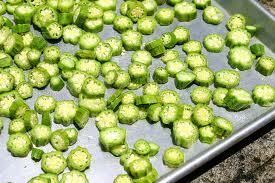 The okra is deep friend after washing it in running water, pat frying and slicing off the caps and tips. Raw mangoes: put sugar in a frying pan add 15 ml or 1 tablespoon water stir over low heat until the sugar dissolves, then add raw mangoes, stir add pepper and salt stir for another 3-4 mnts or until soft. Remove sprinkle lemon juice, stir, adjust the seasoning and keep warm. Re heat the reserved oil in a wok add kalonji and fennel, stir over medium heat until they begin to pop add onions and sauté until translucent and glossy. Add garlic, ginger pastes sauté until the moisture evaporates, then add in the 2 tables of water stir fry till the moisture evaporates, add okra, cherry tomatoes and potatoes, stir fry for 30 seconds, add stock and slat stir fry until the moisture evaporates sprinkle pepper stir, remove and adjust the seasoning. Serve as accompaniment to roti’s or rice. its sounding totally different.. i can understand the reaction.. but i have doubt.. id is nt that we put ginger-garlic paste in 40-60 % ration?? ..
Next PostNext A Hairy-tales Fairy tale ending.